This is the seventeenth book in the Tarzan Series. 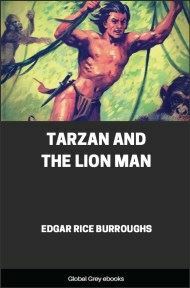 Tarzan and his lion companion Jad-bal-ja discover a mad scientist with a city of talking gorillas. To create additional havoc, a Hollywood film crew sets out to shoot a Tarzan movie in Africa and brings along an actor who is an exact double of the apeman, but is his opposite in courage and determination. MR. MILTON SMITH, Executive Vice President in Charge of Production, was in conference. A half-dozen men lounged comfortably in deep, soft chairs and divans about his large, well-appointed office in the B.O. studio. Mr. Smith had a chair behind a big desk, but he seldom occupied it. He was an imaginative, dramatic, dynamic person. He required freedom and space in which to express himself. His large chair was too small; so he paced about the office more often than he occupied his chair, and his hands interpreted his thoughts quite as fluently as did his tongue. "It's bound to be a knock-out," he assured his listeners; "no synthetic jungle, no faked sound effects, no toothless old lions that every picture fan in the U.S. knows by their first names. No, sir! This will be the real thing." A secretary entered the room and closed the door behind her. "Mr. Orman is here," she said. "Good! Ask him to come in, please." Mr. Smith rubbed his palms together and turned to the others. "Thinking of Orman was nothing less than an inspiration," he exclaimed. "He's just the man to make this picture." "Just another one of your inspirations, Chief," remarked one of the men. "They've got to hand it to you." Another, sitting next to the speaker, leaned closer to him. "I thought you suggested Orman the other day," he whispered. "I did," said the first man out of the corner of his mouth. Again the door opened, and the secretary ushered in a stocky, bronzed man who was greeted familiarly by all in the room. Smith advanced and shook hands with him. "Glad to see you, Tom," he said. "Haven't seen you since you got back from Borneo. Great stuff you got down there. But I've got something bigger still on the fire for you. You know the clean-up Superlative Pictures made with their last jungle picture?" "How could I help it; it's all I've heard since I got back. 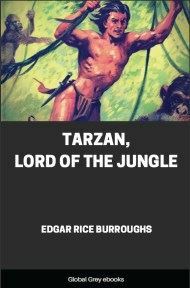 Now I suppose everybody's goin' to make jungle pictures." "Well, there are jungle pictures and jungle pictures. We're going to make a real one. Every scene in that Superlative picture was shot inside a radius of twenty-five miles from Hollywood except a few African stock shots, and the sound effects—lousy!" Smith grimaced his contempt. "And where are we goin' to shoot?" inquired Orman; "fifty miles from Hollywood?" "No, sir! We're goin' to send a company right to the heart of Africa, right to the—ah—er—what's the name of that forest, Joe?" "Yes, right to the Ituri Forest with sound equipment and everything. Think of it, Tom! You get the real stuff, the real natives, the jungle, the animals, the sounds. You 'shoot' a giraffe, and at the same time you record the actual sound of his voice." "You won't need much sound equipment for that, Milt." "Giraffes don't make any sounds; they're supposed not to have any vocal organs." "Well, what of it? That was just an illustration. But take the other animals for instance; lions, elephants, tigers—Joe's written in a great tiger sequence. It's goin' to yank 'em right out of their seats." "There ain't any tigers in Africa, Milt," explained the director. "I do," replied Orman, grinning. "How about it, Joe?" Smith turned toward the scenarist. "Well, Chief, you said you wanted a tiger sequence." "Oh, what's the difference? We'll make it a crocodile sequence." "And you want me to direct the picture?" asked Orman. "Yes, and it will make you famous." "I don't know about that, but I'm game—I ain't ever been to Africa. Is it feasible to get sound trucks into Central Africa?" "We're just having a conference to discuss the whole matter," replied Smith. "We've asked Major White to sit in. I guess you men haven't met —Mr. Orman, Major White," and as the two men shook hands Smith continued, "the major's a famous big game hunter, knows Africa like a book. He's to be technical advisor and go along with you." "What do you think, Major, about our being able to get sound trucks into the Ituri Forest?" asked Orman. "What'll they weigh? I doubt that you can get anything across Africa that weighs over a ton and a half." "Ouch!" exclaimed Clarence Noice, the sound director. "Our sound trucks weigh seven tons, and we're planning on taking two of them." "It just can't be done," said the major.